I’m not sure why but I still keep files with practically every creative writing assignment, essay, and project I ever did since the beginning of high school. I don’t think I’ve ever looked at them since. But after all the hours of work I put into them, it seemed like a shame to just throw them away. In my OAC year I took a creative writing class, and I remember my friends and I challenging each other as to who could write the most over-the-top, melodramatic “phoney-deep” poem that appeared to be making some kind of grand statement about life, but was actually meaningless. That’s how most poetry we were forced to read seemed to us then. So here’s one I wrote in Feb, 1990, called simply “Thoughts.” Re-reading it now some 20+ years on, it isn’t all that terrible, actually. But that wasn’t from a lack of trying. Life’s static yet elusive truths. True joy is only found in ignorance. And wipes out the vanity of time. Why do we keep things? Musings from the attic- why do we keep things? Here’s an interesting blog post from a UK-based company “The Album People” that talks about why humans keep things. It makes reference to a study done by Microsoft in the UK about a common practice it called the “home archiving of cherished objects.” (although I prefer to just call it keeping things.) It struck me as a bit odd that a high-tech company would spend money to research a subject as quaint as home archiving. But then I thought about just how much all the data that’s being uploaded and forever archived on the internet has the potential to fundamentally change how future generations will store and recall their own digitized pasts. Some people have even gone as far as to attach wearable video cameras to themselves and record every minute of their lives (they’re called “lifeloggers“). But even if computers will one day have the power to store everything we’ve ever had contact with and do much of the hard work of remembering for us, it will never replace the need for human brains to interpret and give meaning to all that massive amount of data. 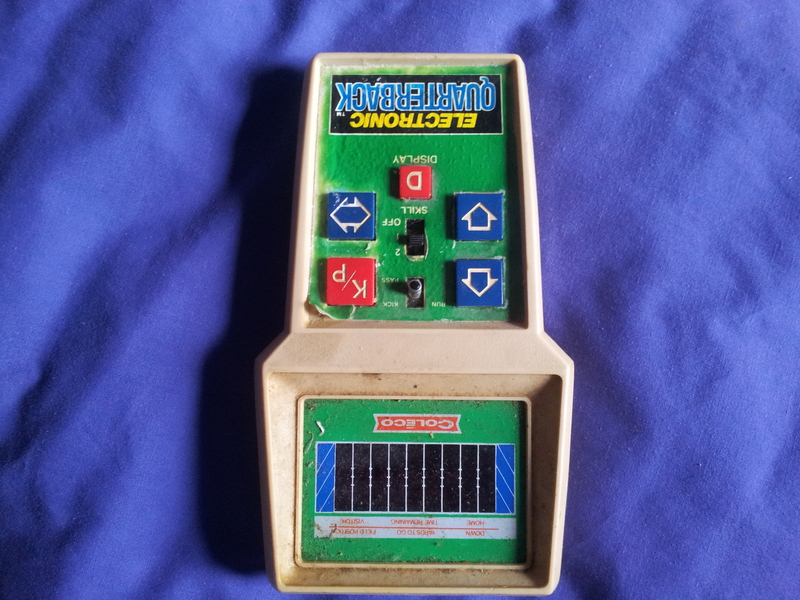 I can recall my friends and I wasting hours frantically thumbing the buttons of this Electronic Quarterback, squinting to watch red LED lights move across a miniscule screen in an extremely rough facsimile of Football. It was simple, but still entertaining enough for our boyish imaginations. Sure, all your newfangled X-boxes and iphone apps may be exponentially more powerful, complex, better looking, and more interesting, but are they really any more fun to play?? 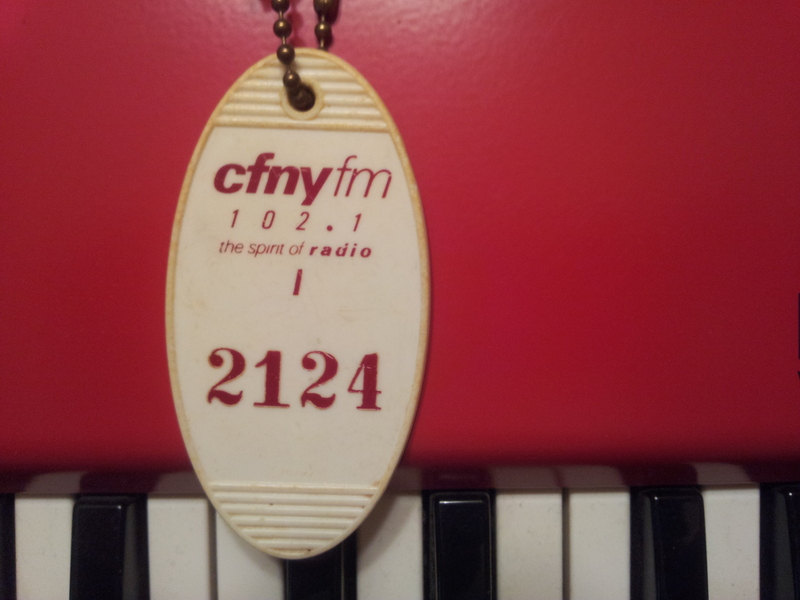 Growing up in Toronto in the early 80’s there was only one radio station that mattered – CFNY. It was ‘alternative’ before the term even existed, spinning the best and most bleeding-edge New Wave, Pop, Rock, and other music of the day, much of it from the UK. I first heard many of the biggest 80’s hits on CFNY that have since become synonymous with the era, often within days of being released. The station was important enough that the band Rush even wrote a song about it, based on the station’s motto “The spirit of radio”. To me, what made it truly great was the sheer variety of what it played and its willingness to take chances on local and lesser known songs that the DJ’s personally liked. In fact, the station used to have a policy that it would never play the same song more than once in a 24-hour period, which is something practically unheard-of in the repetitive playlist world of radio we live in today. Back in the days of cassette tapes, I can still remember staying home on Saturday nights to listen to (and occasionally record) the latest tunes from DJ’s like Chris Sheppard for hours at a time. I don’t recall exactly where I got this keychain but it reminds me of that once-great station that Toronto has never seen the likes of since. 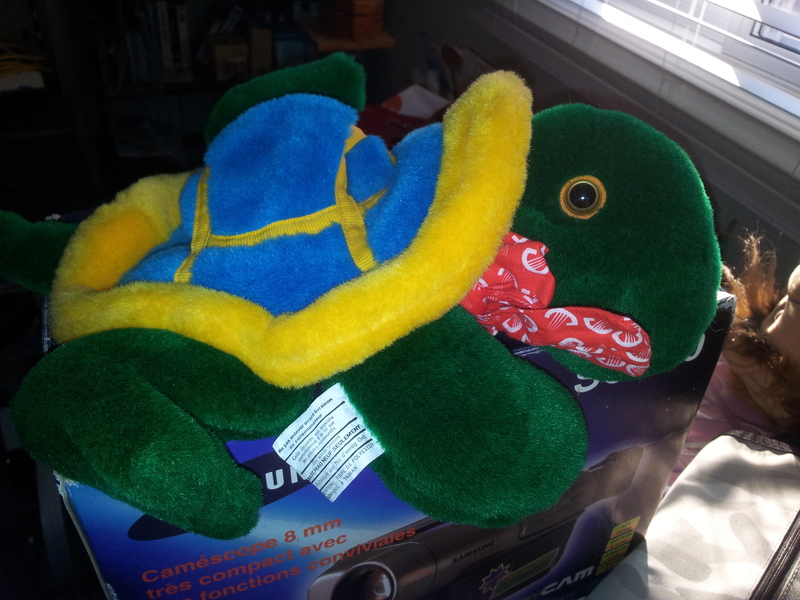 What ever happened to Domer, the SkyDome turtle? Poor Domer. All he ever wanted to be in life was a mascot. For a talking turtle who walks on his hind legs and plays baseball, there aren’t a lot of other career choices. But as luck would have it, Domer got his chance in 1989, with the opening of Toronto’s SkyDome stadium. When I first met Domer I was in rehearsals to be part of the Dome’s opening ceremonies. The show was ridiculously corny and badly choreographed, but I was still excited to be part of the action and get a chance to be on the field in front of a crowd of 50,000. I was part of the “We are Toronto” segment, representing the Ukrainian community, along with 67 other nations. But alas, Domer’s career would be short-lived. The opening ceremonies ended up a complete fiasco, with the organizers insisting on opening the roof despite torrential rains which flooded the entire field with several inches of water (it was a domed stadium, so why would they need a drainage system?) Expensive ethnic costumes and equipment were ruined, leading to a class-action lawsuit by some of the performers. And within a decade, the SkyDome itself would be bankrupt and known as the “mistake by the lake,” with the already severely over-budget stadium sold off to the private sector for a fraction of its original price. Domer never stood a chance. Finding himself unemployed and relegated to the dustbin of mascot history, he promptly hid himself in the back of a closet in my parent’s house, where he’s been ever since. But I managed to coax him out long enough to snap this one rare photograph. I first started discovering the music of the band Grateful Dead in the early 1990’s, just a few years prior to lead singer/guitarist Jerry Garcia’s untimely death. At the time, the band’s legendary live shows were at an all-time high in popularity, and the band was one of the highest grossing live acts in the US, if not the world. Unfortunately I never got around to seeing them live, at least not until many years later when the remaining band members toured under a different name. I bought this t-shirt on a whim from one of my favourite Toronto record stores that was owned by a guy who actually used to work for the band as a gardener in the famous Haight-Ashbury hippie district of San Francisco (Hmm..I wonder what kind of plants he used to “garden”??) I think I wore it in public only a couple of times. I liked the idea of feeling part of the “Deadhead” tribe, and craved that sense of community that the band’s ardent followers had developed. 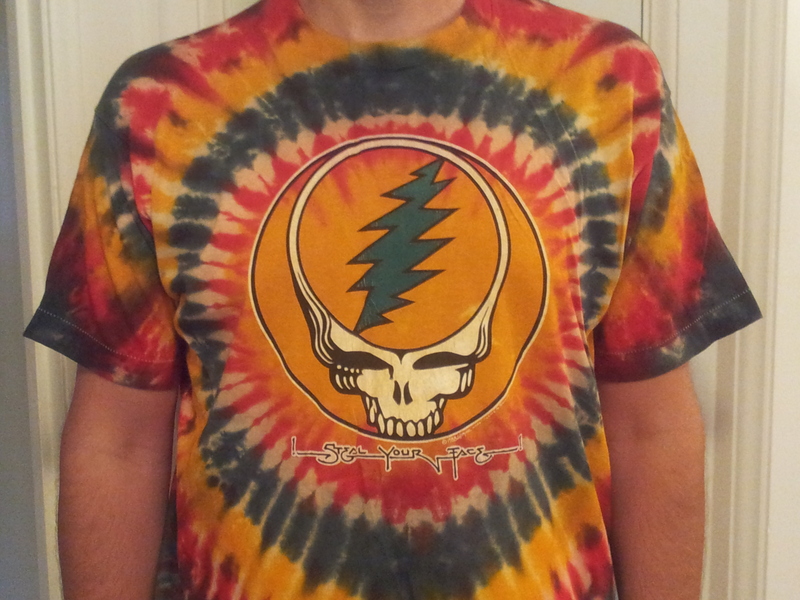 But I soon found out, it takes a lot more than one t-shirt to become a Deadhead, and I was just too busy in school to commit to the lifestyle.